This book is a companion to the KM Method Cards. There are 80 KM Methods Cards. 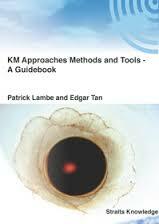 Many of them are useful as definitions of KM-related terms that are commonly found in the KM grey literature and among practitioners. What is [name of method]? As a knowledge management practitioner, it's very useful to know that all these different approaches are available to facilitate our work. At the same time, I'm not sure it would be wise to try to become proficient in all of them. Increasing the range of approaches one is comfortable with might be a good idea and could be part of a professional development/continuous learning effort. As a side note, I've found a number of practitioners who enjoy creating new terms to differentiate their unique approach from what's been done before. I'm not sure it's always helpful. There is enough confusion and you end up having to say things like "it's like a ______ but not exactly". That being said, I'm doing exactly the same with the term "insight mapping" and I'm justifying it by arguing that it's truly unique and very distinct from concept mapping, which would be the closest term. Let's admit it then, I'm no different. I'm trying to differentiate my brand to some extent. Identify 3 methods from the book that I am not yet familiar with, learn more and develop opportunities for utilizing each by end of 2017.